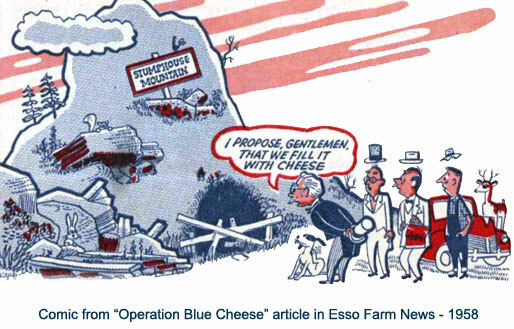 The first Clemson University Blue Cheese was cured in Stumphouse Mountain Tunnel in 1941. Since then, the homemade gourmet item has worked its way into the hearts and stomachs of an ever-growing number of aficionados. The history and folklore surrounding this scenic spot in the Blue Ridge Mountains is legendary in the Piedmont area of South Carolina. The name Stumphouse originated from the Native American Legend of Isaqueena. The Native American maiden Issaqueena fell in love with David Francis, a silversmith who lived near what is now Ninety Six, South Carolina. Learning that her tribe planned a surprise attack on her lover’s settlement, Issaqueena mounted her pony and hastened to warn the settlers. On that fleet, silent ride through the forest, she mentally named the landmarks she passed en route: Mile Creek, Six Mile, Twelve Mile, Eighteen Mile, Three and Twenty, Six and Twenty, and finally Ninety Six. Today in South Carolina there are the post offices of Six Mile and Ninety Six, and the creeks bearing these names that Issaqueena conferred upon them. She estimated her journey at ninety-six miles. It is actually 92 miles from her starting point in Ninety-Six, South Carolina. Issaqueena and David, according to the legend, fled into the mountains to escape the fury of her betrayed tribe. The lovers lived in a large hollow tree or Stumphouse. Finally tracked down by her tribesmen, Issaqueena raced to a nearby falls (now Issaqueena Falls) and plunged out of sight into the cataract. Believing her dead the warriors gave up the search, but Issaqueena later joined her husband and fled to Alabama to live happily ever after. Pioneers of Southern industry dreamed of a railroad connecting the fertile midwest with the busy port of Charleston, South Carolina. The tunnel through Stumphouse Mountain was to be a vital link in that road. The work was begun in 1852, and in 1859 the completion of the tunnel was anticipated within two years. It was the Blue Ridge Railroad (now the Anderson division of the Southern-affiliated Carolina and Northwestern Railway) that attempted to construct this line through and over the mountains to Knoxville, Tennessee. North-South hostilities halted the work. After the war, efforts to reactivate the project failed and the tunnel was abandoned. Clemson A&M College bought the tunnel in 1951. The south entrance of the tunnel became a historic landmark in South Carolina. The cool, refreshing breeze that blows out of the tunnel is long remembered by summer visitors. The tunnel measures 25 feet high by 17 feet wide and extends 1600 feet through a granite formation into the heart of Stumphouse Mountain. At the midway point, a 16 by 20 foot airshaft extends upward 200 feet to the surface. Cold air moving out of the mouth of the tunnel pulls warm air down the shaft. The moisture in this warm air is condensed by the cold air in the tunnel and produces a constant wetness in the tunnel, which is favorable for curing blue cheese. The unfinished Stumphouse Mountain Tunnel lay idle for 80 years, visited by tourists and picnickers through the years, serving no useful purpose. In 1940, an alert Clemson A&M College professor recognized the possibilities of curing blue mold cheese in the tunnel. With this thought in mind, the Clemson A&M College Dairy Department began experimenting with the manufacture of blue cheese and curing it in the tunnel. The debris that had accumulated during three quarters of a century was cleared out, equipment for cheese curing was moved in, and the project was off to a successful beginning. The outbreak of World War II in 1941 limited production, and the work was discontinued in 1944. Clemson lost skilled specialists; the milk used for cheese was needed for aviation cadets quartered on campus; and litigation arose as to the ownership of the tunnel. In 1951 Clemson A&M College was successful in purchasing the tunnel. With adequate milk supplies again available, Operation Blue Cheese was re-initiated. Operations were resumed on an experimental basis in 1953. Selected Brown Swiss and Holstein milk from Clemson’s dairy herd consisting of 680 animals was used to make the Roquefort-style blue mold cheese. The cheese was manufactured on campus, transported 30 miles, and cured in the tunnel. In October 1953, some 2500 pounds of blue cheese was curing in the depths of Stumphouse Mountain Tunnel. The production was directed by D.H. Graham, a native of Mississippi and a recent Ph.D. from Iowa State College. He joined the Clemson Dairy staff in August 1953 to initiate the manufacture of blue cheese and carry on other dairy products research. Indications were that the product would be ready for market in April or May 1954. The Clemson Dairy Department was pleasantly anticipating the time when cheese connoisseurs over the country could again enjoy the tangy, piquant flavor of Clemson Blue Cheese. Blue cheese was cured in the tunnel from 1953 to 1956. The environmental conditions in the tunnel were carefully analyzed, mold strains suited for these conditions were developed, and curing procedures were investigated. Curing in the tunnel was suspended during the summer months because of the warm temperature. The Agricultural Center in Newman Hall was built at Clemson in 1956. Air-conditioned cheese ripening rooms were designed to duplicate the tunnel's high humidity and temperature. Research studies were begun on the campus early in 1956. The air-conditioned rooms have eliminated the need for suspending operations during the warm summer months, which was necessary in the tunnel. In 1958, all manufacturing and curing of blue cheese was conducted on campus. The continuing search for new and more efficient methods is a contribution of modern agriculture to our nation's economy. In 1964 the college was renamed Clemson University as the state Legislature formally recognized the school's expanded academic offerings and research pursuits. In 1970, the tunnel was leased to the Pendleton Historical District Commission, which converted the area into a picnic spot and tourist attraction. The south entrance of the tunnel was a historic landmark in South Carolina for many years. After a rockslide inside the tunnel in the mid 1990's, the tunnel was closed to visitors. After strenuous safety testing, the city of Walhalla has reopened the tunnel as a landmark site. Clemson Blue Cheese is an artisan cheese, made the old fashioned way. Each 288-gallon vat makes a batch of about 240 lbs, which is then salted, waxed and aged for 6 months. When it is ready, each hoop is scraped and packaged by hand. Each lot is kept separate, and strenuous record keeping assures quality at every step.